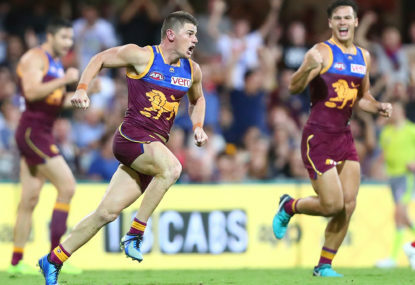 The Brisbane Lions have secured their third victory of the season and heaped more pressure on Carlton and their coach, Brendon Bolton with a thumping 65-point victory at the Gabba. The Blues started the game well and controlled much of the first term, winning the contested possessions (35-25), inside 50s (15-7) and tackles (14-11). However, Carlton were unable to capitalise on their dominance, booting 2.5 for the term. The Lions, conversely, made the most of their limited inside 50 forays, booting 3.1 to lead at quarter time. Brisbane blew the game wide open in the second term, booting 5.6 to just one behind, as they took a comfortable 37- point lead into the main break. Any chance of a Carlton comeback was snuffed out in the third term, as the Lions piled on six goals to two and turned for home 63- point leaders. Carlton at least gave a yelp in the final term, booting three goals, but it was an overall deplorable effort from the Blues, who have been very competitive in their past two matches against Collingwood and Port Adelaide. Brisbane finished with over 100 more disposals than the Blues (442-297), and, tellingly, took 24 marks inside 50 to Carlton’s eight. Remarkably, Carlton won the inside 50 count (51-49), despite losing by more than ten goals. The Lions’ win sees them move two games clear of bottom-placed Carlton and they will move up to 16th on the ladder, should Gold Coast lose to North Melbourne, as expected. The Lions had winners all over the ground. Former skipper, Dayne Beams was enormous, with a game-high 40 disposals, nine marks, eight clearances and a goal, while Eric Hipwood booted a career-high six goals. There wasn’t much to smile about for Carlton, but three goals to Charlie Curnow, as well as Lochie O’Brien’s first career goal would have given Blues’ fans some reason for optimism.